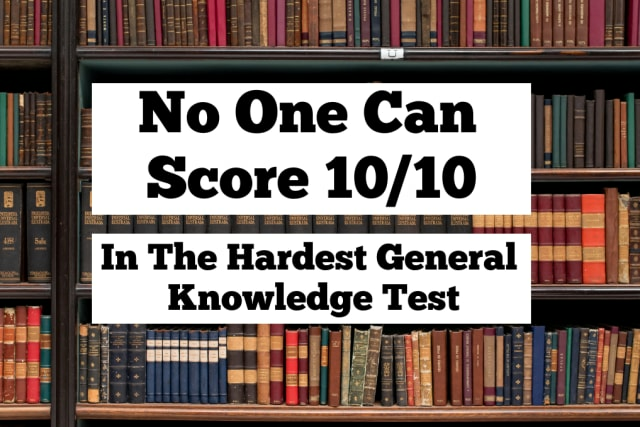 Can You Score 10/10 In The Hardest General Knowledge Test? Do any words in the dictionary rhyme with 'orange'? What is the average life span for a dog? Which U.S. president appears on the front of the $2 bill? You've just made history!! You scored 10/10!! You appreciate knowledge, and you have outstanding memory skills. You can easily recall names and images, and you probably enjoy traveling by yourself. Keep it up, genius! You appreciate history and geography, and enjoy visiting historical places. You make time for things that matter and never stop learning. Keep up the good work! You got 8/10 correctly. Your general knowledge is in the 95th percentile. Keep up the good work! Congrats!! You got 7/10 correctly. It’s more than 95% of the population, but give it another shot to see if you can get a perfect score! You got 6/10 correctly. Most people can't score more than 5/10. SHARE this confusing general knowledge quiz to test your friends! You scored 5/10 correctly, which is more than 90% of the population. It's not bad, but give it another try to see if you can get a perfect score! You scored only 4/10. How disappointed are you? Let us know in the comments. You got 3/10 correctly. Are you disappointed? Let us know in the comments.